A prototype of the Porsche 911 R has been caught on camera once again without any camouflage, but it does not have all the final bits and pieces. If you are not a diehard Porsche fan, it’s probably a bit difficult to keep up with all of the 911 versions. Prepare to be confused even more as a “pure” R is about to join the family and it will be based on the existing 911 GT3. Here we have a prototype that does not have all of the final body parts and as you can see the headlights and taillights come from the pre-facelift 911. It will lose the GT3’s rear wing and will instead feature an active rear spoiler. Other body changes are also on the agenda, including a new front aero splitter and an overhauled rear diffuser while the wheel arches are rumored to be more prominent. Carbon ceramic brakes and a Clubsport package are set to be offered at an additional cost by Porsche and a while back we heard it will get a set of bespoke 21-inch wheels. 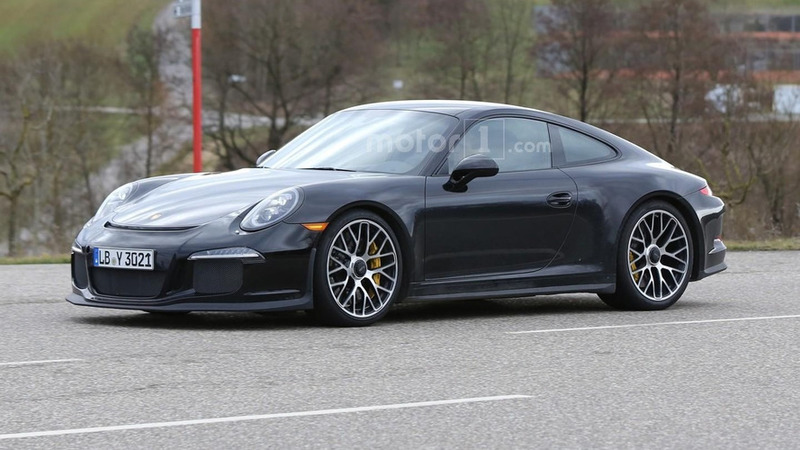 It will carry over the GT3’s naturally-aspirated 3.8-liter flat-six engine with 475 horsepower, but the big news is a rumored six-speed manual gearbox set to be the sole offering on the R.
The Porsche 911 R will be a special edition and apparently only 600 units are planned for production. However, a recent report indicated all of them have already been sold for more than $160,000 apiece ($30,000 more than a GT3). Developed to celebrate the 50th anniversary of the original 911 R, the latest limited-run model from Stuttgart will bow in Geneva on March 1.